Note that the username is all lower-case. We are currently testing out some additional MCUs some comes with Ethernet so the inclusion of TCPIP stack could be included in the future scope. We also have received some request from Apple/Mac OSX users and as we currently don’t have access to any Apple/Mac OSX system and without any funding we cannot proceed on this. However, information pills if we can get some substantial sponsorship/donation we will proceed on this as well as intensively continue our development. We are currently deciding to go with either phpBB or SMF. If you have experience with these forums please let us know your opinion. Arduino platform has definitely enabled a lot of people including those non-tech savvy ones to enter into the electronics worlds. From the beauty of Arduino, now comes the challenge in making Arduino-like environment accessible across as many hardware platforms as possible. This would enable the simplicity and yet powerful Arduino platform to harvest on more powerful resources provided by different hardware to overcome hardware limitations based on different needs. Now as XDUINO-IDE is ready for download, these are the list of components you will find in XDUINO-IDE. This platform provides ease of compiling and uploading to the ARM Cortex-M3 devices by simply clicking the button on the main interface : -). What are you waiting for, you can signup to download it now from Download page. ARM Compiler is also part of the XDUINO project. programming with Arduino syntax or ARM general programming can be done immediately. There is no need to set compiler options. The bundled FREE ARM Compiler has been tested with Cortex-M3 STM32 Thumb-2 instructions. With ease of programming either by XDUINO-IDE or other IDE such as Keil, IAR, etc. One can easily build embedded application with Arduino commands. The FREE ARM Compiler is bundled within the XDUINO-IDE package. 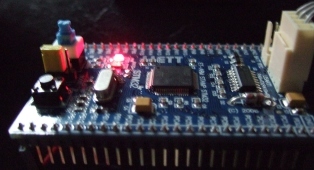 Once XDUINO-IDE has been installed, programming with Arduino syntax or ARM general programming can be done immediately. There is no need to set compiler options. The bundled FREE ARM Compiler has been tested with Cortex-M3 STM32 Thumb-2 instructions. First, we would like to thank those who have given feedback on XDUINO IDE which contains ARM Compiler, libraries, and other tools necessary for getting the Xduino project running. If you get anti-virus warning from running the software, you can ignore it if you have signed up and downloaded the software from our site. The warnings are inaccurate. We have seen this generally happens with compressed/encrypted executable files. For some anti-virus program you might have to make it explicitly exclude the XDUINO-IDE executable file from the anti-virus software. After starting the IDE if you see “Verifying” at the bottom of the IDE, it means that the IDE is trying to Verify your registration information. There is no need to wait for this to complete if you have registered properly. You can start using the IDE immediately. Please support us by donating to us so we can continue to develop this project further. easier way to pay online! This contains XDUINO Integrated Development Environment with upload tools (interface for programming and uploading to the device). Please signup at Download signup page and we’ll contact you with download instructions. Xduino currently supports the following ARM Cortex-M3 STM32f103ret6 board. If you are interested in getting this board you can contact us. Connector is placed on 50 Pin Header with a distance of 2.54mm (100mil) (25 pins per side) with a distance of 1.5 inch (1500mil/38.1mm), so it is quite easy to use and expand I/O Circuit. Moreover, it can be used with Project Board and PCB. XDUINO-IDE (v0.91) with integrated uploader tool is finally here. The current release will only be available for those who have bought an XDUINO board from us. If you have bought a board from us and wants to download the IDE, site please send us a note and we’ll get back to you asap. XDUINO package with library files has been renamed XDUINO-lib. Now if you can program an Arduino then you can easily program on Xduino on 32-bit platform of ARM Cortex-M3. Want to use low-cost microcontroller with simple programming language and high performance? You can use Xduino + Arm Cortex-M3 STM board. Xduino project has been started in order to bring Arduino-like environment to different hardware platforms. (Note: Xduino supports all Arduino functions except analogReference()). Software for state machines faces difficulties in covering all of the conditionals associated with these structures. This article applies long-established principles, adds some original details, and allows developers to routinely design their own state machines in software with no missed conditionals. These LoRa boards let developers deploy designs in remote areas without the need for constant servicing or battery replacement/recharging. The MAX22513 Dual IO-Link transceiver is said to be 3x smaller and 4x cooler than competitive solutions. Today’s increasingly ambitious mission requirements are demanding higher levels of autonomy and greater navigational precision from spacecraft, requiring more than logic-based AI. Designers can develop IoT sensor solutions using only solar energy harvesting with ON Semiconductor’s Bluetooth Low Energy RSL10 Multi-Sensor Platform. New IP packages existing MIPS and dataflow blocks with a new tensor core unit, initially targeting inference jobs at the edge. Rapid innovation in virtual reality (VR) and augmented reality (AR) products depends on the right components able to support the required processing and imaging capabilities required while reducing power consumption. By preprocessing sensor data, smart sensors alleviate the power and data rate drain that occurs when all sensor data processing must be handled by a host CPU in ADAS applications. An expected increase in vision-related activity would not be possible without the emergence of new algorithms and development tools to speed adoption of vision-based systems. Although 60GHz millimeter wave (mmWave) technology has historically seen its greatest use in military and scientific research applications, it offers significant benefits that will drive its use in mainstream commercial applications. Content of this website is Copyright (c) 2009 Ram Narula all rights reserved.